« OMG -- More Smoke! Black / white differences are huge on a host of issues, which has an impact on aggregate numbers, which makes the US look "bad" compared to Europe. I recall reading through FBI crime stats and realizing that African-Americans commit violent crimes at approximately 5x the rate as European Americans, who in turn commit violent crimes at approximately 5x the rate of Asian Americans. That fact right there renders moot almost every discussion about gun control ever. Oh, sophisticated Europeans and Japanese have fewer murders than we do, and therefore we should emulate them and revoke our Second Amendment? FAIL. Now, now, Warren! You, and Dr. Budreaux and Dr. Perry ALL know, that Professor Krugman got a lobotomy when he went to the Times, and now numbers and statistics are just fuzzy things that all those sill academics use (well, silly if they don't agree with him, of course!). If Dr. Krugman continued using the economic lens, rather the political one, to view his subject matter, he'd have been fired a decade ago. We can't have actually critical thought on the pages of the Gray Lady now, can we? 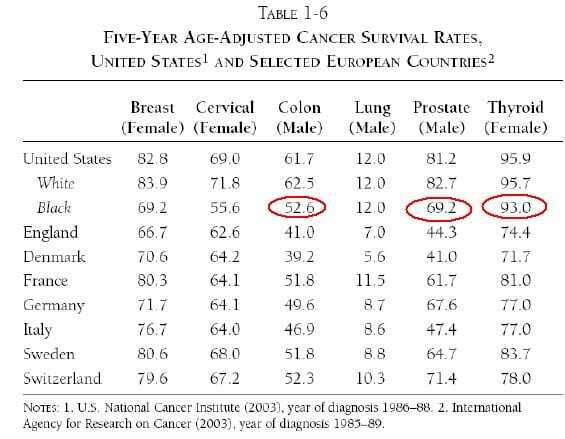 Krugman's addressed this in the past, actually... he claims that the 5-year cancer survival rates are an unfair comparison because US residents enjoy much better cancer screening, which elevates their survival rates over Europe. Of course, it begs the question of why we should have better screening. Isn't that supposedly one of the major benefits of socialized medicine? The CDC, NIH, HHS, etc. 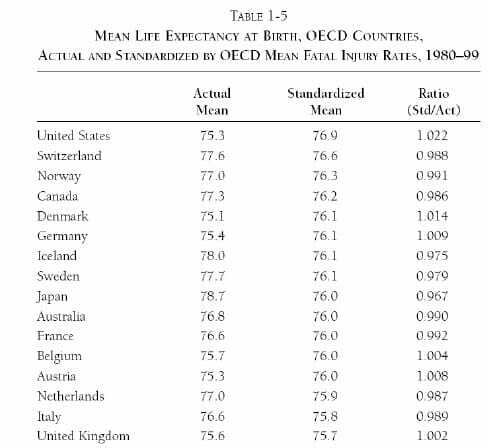 are quite pleased that the USA has what appears to be both a lower life expectancy and a higher infant mortality rate than other first world nations. By not being number one, those government agencies can justify requests for more funding. But, in reality, we would be number one in life expectancy and have almost the lowest infant mortality rate if we reported infant deaths the same way as other countries. In most countries, if a prematurely born infant dies days or weeks or even months after birth, the death is categorized as a stillbirth. Some countries classify any infant death within 30 days of birth a stillbirth, even if the infant was born healthy after a full-term gestation. These countries already have socialized medicine, and they do everything possible to improve their health-related statistics. In the USA, if a baby is born, takes just one breath (or has air pushed into its lungs), and dies, then we categorize that as in infant death even if the baby was more than three months premature. Since we have the best neonatal care in the world, we try to save almost all prematurely born babies. But, not all the premies can be saved, so our infant mortality statistics appear to be much worse than in other countries. Also, each infant death has a huge impact on average life-expectancy statistics because an infant death subtracts approximately 80 years of life from the total. Thus, we look bad. However, I will bet any amount of money that if the federal government socializes medicine, our statistics will dramatically improve by changing the criteria for an infant death.